Our friend Jan had a batch of these heart-healthy berry orange muffins waiting for us when we arrived home from the hospital after my husband’s heart attack. They were an instant success with Larry and I have been baking batches of them these past three months during his successful recovery. These muffins have no added salt and are low in fat and sugar, yet there are enough other flavors and ingredients to make them rival any full-fat, high calorie bakery muffin. Jan ordered me a 3/4 muffin cup-sized pan that helps manage portions as well. One of the aspects of baking that I detest is all the cleanup afterwards. All you need here is one good-sized mixing bowl and a couple of two-cup measuring cups. These freeze beautifully and I divide them into three or four muffins per freezer baggie. TIP: I prefer to use frozen blueberries here since they can be mixed into the batter without turning the muffins purple. 2. Using one of the measuring cups, combine the oats, flax and buttermilk. Set aside. 3. Using the other measuring cup, combine the flour, baking powder, baking soda and cinnamon. Set aside. 4. In a large mixing bowl, lightly beat the egg. Add the sugar, canola oil and vanilla. Mix well. 5. Zest the oranges into the bowl, then squeeze the juice into the mixture. 6. Add the dry ingredients and mix until just combined. 7. Add the blueberries, dried cranberries and walnuts. Mix gently. 8. Spoon into lined muffin cups. Bake for 15 minutes. Wait 10 minutes before turning muffins onto cooling racks. These look and sound delicious! Blueberries are one of the largest crops here in Maine, too, so I’ll have to try these out when the season hits. Have you ever tried Saco powdered buttermilk? I’ve used it in the past with much success. Thanks for the recipe! And so glad to hear how well your husband’s doing – that is wonderful. Nothing like wild Maine blueberries! I will have to look for that powdered buttermilk – thanks for the tip! So sweet of you to share the story! 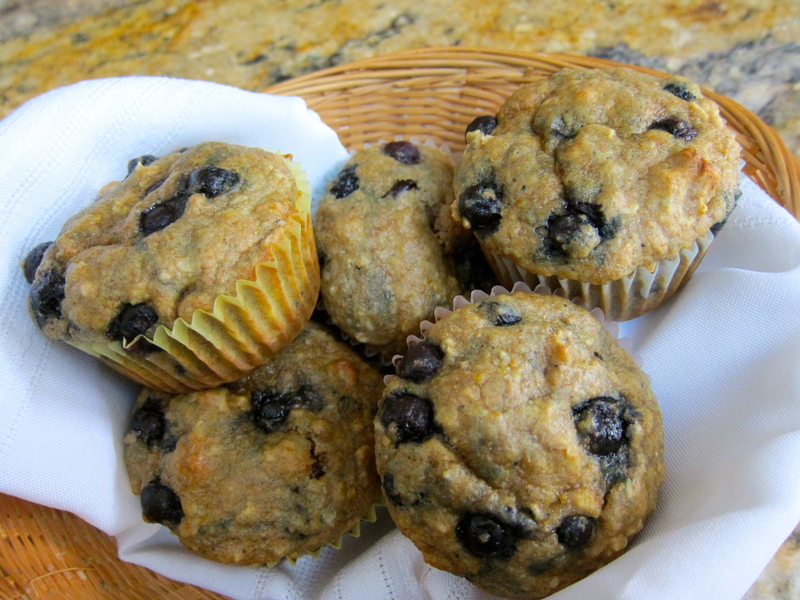 You’ve made these muffins even better by adding flax seed. I’ve used powdered buttermilk — it’s “ok” in a pinch — maybe I need to try the Saco brand. Hey, Jan, thanks for checking out my new site!! Not only healthy – these really sound delicious! I’m eating one right now – 😉 Thanks, Lynda! These sound great! The bonus for me is the milled flax. As an “almost vegetarian”, I look for sources of omega 3 wherever I can! Thanks for posting this, Liz! I understand. I keep a bunch ground up in a tupperware thingy and sprinkle it on all kinds of things. I even sprinkle it over salads for a nutty kind of added flavor. These sound both healthy AND delicious, can’t wait to try them! Thanks – I hope you try them and let me know how they worked for you.